I am a huge fan of mushrooms in design elements. They’re so earthy and homey; simple and fresh. I think they even have a sort of cozy-rainy day feeling, that makes you want to curl up with a cup of tea and a book. In fact, one of the first items I put in my Etsy shop was a quilling paper mushroom and it remains one of my favorites to date. 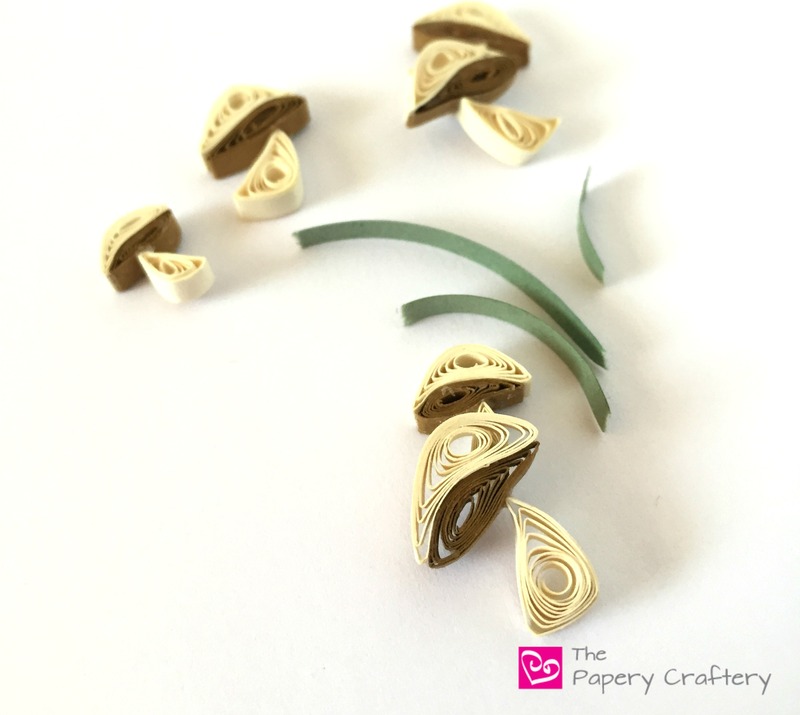 I am so excited to share a tutorial on how to make mini quilling paper mushrooms. They are easily done and a perfect, quick quilling craft for the beginner who might be looking for a little something different. Just a couple of supplies needed for these cuties: two colors of quilling paper (I use ivory and a medium golden brown), a quilling tool and some glue. Easy peasy and carrots, as my Moose would say. So easy, in fact that each mushroom is made of only 3 elements. A 6 1/2″ ivory coil for the mushroom cap, a 5″ brown coil for the mushroom gills under the cap, and another 5″ ivory coil for the stem. Once the coils are set, start forming them into the elements of the mushrooms. Even though each mushroom cap that you make can be a slightly different shape (it is nature, after all! ), I start by forming the biggest coil into a modified half-moon shape. I like to push up slightly on one side of the bottom, and down on the other side of the top. The result is sort of a topsy-turvy mushroom cap, that I find pretty whimsical and sweet! Next comes the gills, or the underside of the cap. In order to fit against the wiggly mushroom cap, form a shaped marquise by squeezing both ends of the brown coil, and push down on one side, while pushing up on the other. Next, form the little, tiny stem for this mini mushroom. Bend the last ivory coil into a shaped teardrop, by pinching one end into a point, while pushing in on one side. I like to flatten the bottom, too, but that’s totally optional. Now, it’s time to put it all together! With a little glue, fit the mushroom cap and brown gills together, like the pieces of a puzzle. Once you have the top the way you like it, add the stem with a dot of glue. Tweezers may come in handy here! You can whip up a ton of these beauties in no time. Add a few blades of green grass, and you’ve got a whole forest of mushrooms waiting to pretty up your autumn cards and tags. I hope you find these quilling paper mushrooms as sweet as I do. I’d love to hear what you think! Leave a comment below with your thoughts and stay tuned for the other fall quilling tutorials I have coming soon! These are just too adorable. Happy quilling! Such wonderful delicate looking work. They are so beautiful. Many thanks for sharing you artistic and creative talent. Such kind words! Thanks so much for stopping by! You’re so welcome! I’m glad you chose the mushroom tutorial to comment on. They’ve always been one of my favorites! They are beautiful. Gonna try them today. Thank you Wendy! I love this tutorial too. Meredith you are very talented! I just came upon your site and will continue to check out more of what you do. I am new to quilling and this mushroom tutorial is very well written and easy to understand. I’m going to give it a try soon. Thank you for taking the time to share the awesome details! I’m glad you’ve found me, Charlotte! The mini mushrooms are a great beginner project. Let me know how it goes!